We identified 3,868 noncoding mutations including 394 located <5 Kb downstream, 1,762 intergenic, 1,621 intronic, 81 <5 Kb upstream, 7 UTR 3′, 2 UTR 5′, and 1 intragenic variants. How upstream, downstream and intragenic variants are defined? Shouldn't intragenic variants be classified within intronic variants, and upstream/downstream within intergenic variants? Edit: By adding the different numbers it seems they are mutual exclusive. While upstream/downstream variants can be defined as intergenic variants that lie close to genes, I haven't found a definition to tell the intragenic variants from the intronic ones. 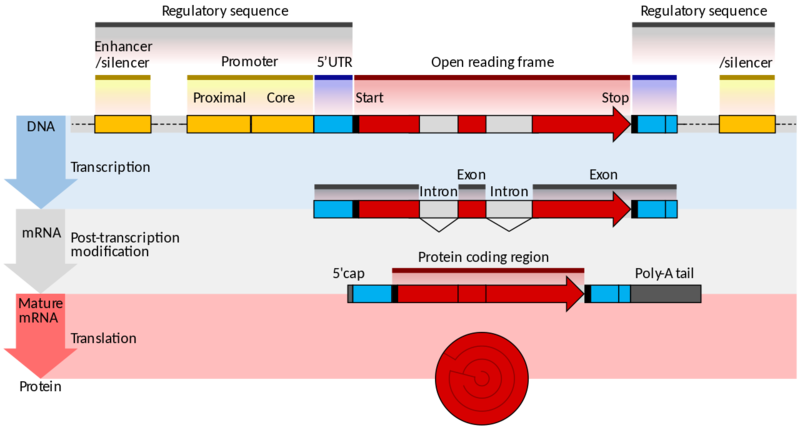 Edit 2: The only explanation I could think of for intragenic variant is that it is located in a coding region which is not transcribed due to alternative splicing. Can it be possible? Oshima, Koichi, et al. "Mutational landscape, clonal evolution patterns, and role of RAS mutations in relapsed acute lymphoblastic leukemia." Proceedings of the National Academy of Sciences (2016): 201608420. <5 Kb downstream: outside of the transcribed region, but possibly part of the promoter or an enhancer (yellow boxes before coding region). UTR 5′: in the transcribed region, but not part of the coding region, as shown in the picture (blue box before coding region). Intragenic means the variant is located within the same gene, which only implies that the sequence analysis assigned a certain variant to a gene. So, there is incomplete data regarding the gene product (such as different splice forms). Not the answer you're looking for? Browse other questions tagged genomics variant or ask your own question. Can different bacteria strains of same species have different genomic sizes?